Encyclopaedia Metallum: The Metal Archives • View topic - Dismember is back! 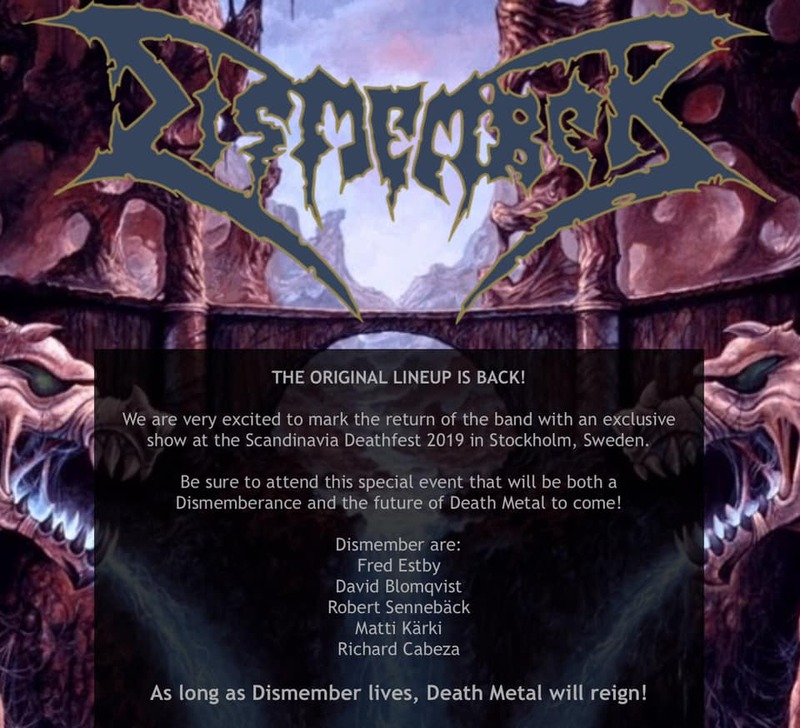 After years of rumors and cryptic statements from the band members, just an hour ago it was finally announced via Facebook Dismember has officially reformed with the whole original lineup (Matti Karki, Robert Senneback, David Blomqvist, Richard Cabeza, and Fred Estby) and will be playing Scandanavia Deathfest in 2019! "My lifestyle, determines my deathstyle"
Brilliant news. Please organise an Australian tour ASAP. One of the best live bands I've ever seen. Oh wow, was just playing Like An Everflowing Stream and thinking how great it is. Um, can I have Bolt Thrower back next? YES!!! My favourite DM band. Hope there'll be some UK shows in due course. Wish I could make the trip to Sweden for the legendary lineup. I wonder if a new album would be in the works or if it is just a few festival shows. A new album and I would be happy. Really, really happy. I can't explain, but I had a feeling for years this is goin' to happen...Every now and then I go to their MA page to check are they finally back, and now they are! Great! This basically puts everything right in the world. I'll be there. Jesus I saw that it's in 2019 and thought about how far away that is being next year and all then lo and behold I realized that it is 2019. Always nice to be reminded how old I am by my failing cognitive functions. Can you blame 'em? This kind of band could plug away forever and be underrated or they could take a break and come back bigger than ever. Seems like a fine time to go back and re-listen to some of their back catalogue. I'd love to see 'em live. When these guys broke up in 2011 it was like a hole was left in the genre that would never be replaced. A few days ago I was thinking how great it'd be if the original line-up, as far-fetched as it may be, reformed and the band started doing new music again. Well, I get half that since there's no talk of anything new. I'll take them being active again as good of a sign as I'll get. technically Dismember was p much on hold since their last album, that gig in 2011 was their first in years. Where did you read there's no talk of anything new? I mean sure, there's no mention of it yet but I'd say it's pretty much inevitable that they'll record more material, given the time constraints and distance issues that caused the initial breakup have been resolved. As an aside, I've been on a massive Dismember kick for the last month or so - I finally finished my collection, so now I have every album and it's made me realize that they have an extremely solid discography. There's not one album I can point to as being a low-point, even the lone album (Massive Killing Capacity) where they kind of vaguely tipped their toes into groovier territory in a few songs is still fantastic and miles ahead of garbage like Grave's Hating Life, Unleashed's Warrior, Desultory's Swallow the Snake or god forbid, Entombed's Same Difference . A North American Tour and all shall be well. This thread got me to realize I wasn't giving the 2008 album enough love. It's actually really good, though I'm in the crowd that also really enjoys Where Ironcrosses Grow so take my opinion as you will, hell I didn't mind Hate Campaign that much, and a lot of people dislike that one. Still, more anything from them, and I'll be a happy man. ...hell I didn't mind Hate Campaign that much, and a lot of people dislike that one. This is a very, very good album and I can't fathom why it isn't more highly regarded. A very vicious, unrelenting album. I saw them on the tour for this album too, excellent show. Great news but it was honestly kind of predictable, it's kind of a trend for bands like this to split up only to reform some years latter. Exactly this, these self imposed breakups/retirements rarely ever stick. This reformation is hardly surprising. That said, I am glad it is with Estby, something was off for me with Daun's drumming on the 2008 album and I wanna say it was the snare drum tone. It was a nice organic, deep booming tone, but that's more suited for a classic rock band, or an indie rock band or something along those lines. It just felt off to me. Nothing bad to say about his playing, no doubt Daun's a fine player, I just think Estby's tone and feel better suits what Dismember does. i think they have the 2nd best discography in death metal after bolt thrower. Hate Campaign is boring save for patrol 17 which is one of their best melodic songs. First time I saw them I kept yelling out for it and they played it. Love it. anyone know what exactly they mean by "exclusive european appearance"? i'm guessing it's their only show in europe this year? That's exactly it, only show in Europe. They're probably doing some overseas dates (or not), but taking into consideration the usual "exclusive appearance" banter I'd say they'll only play there in Europe. It's next to home, it's safe and inexpensive so for them it's all good. scandinavia deathfest was sold out in a day. im pretty sure they will play a couple of the other deathfests in 2020.